Malaysia and Singapore are definitely way up my list of places to visit in South East Asia. I’ve always considered these places as the two most progressive countries in this part of the world. Being a self confessed “urban development junkie, ” sparks of excitement come out from inside me whenever I think about getting to visit iconic places in person, especially those I usually see in NatGeo’s “Mega Structures” or read about in SkyscraperCity. After months of planning, me and my siblings were off to another bonding session … a five day do-it-yourself trip to Singapore and Malaysia. 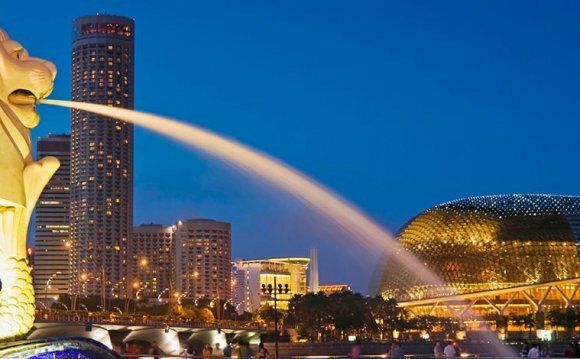 We arranged to start our trip in Singapore for the first three days and then head to Kuala Lumpur, Malaysia during the last two remaing days. Unlike our first time traveling together, planning for this particular trip had its major mishaps. Just two weeks before our scheduled departure (while contacting our chosen hotel for reservations), we found out that our travel dates coincided with the F1 weekend, one of the most popular events in Singapore. The hotel and most places I’ve researched online were already fully booked. Luckily, one guesthouse confirmed our reservation before I could give in to panic. It was all systems go once again! We left Manila early in the morning for the two++ hour drive to Clark International Airport. We chose to depart from Clark because it was cheaper (compared to flying from NAIA) … I was particularly interested to visit the Clark Airport, which is planned for the long-term as a replacement of NAIA. Clark International Airport New Passenger Terminal Building Under-Construction. The design reminds me of the Iloilo Airport, although in a smaller and less elegant form. Cebu Pacific uses the budget terminal of the Changi Airport, not much WOW factor during arrival but when you step out of the budget terminal and go to the other terminals, it’s a totally different story. At least now I know how a first-world international gateway should look like. Since it was a DIY trip, we mostly used public transportation to get to our destinations. Getting around Singapore was very easy and convenient because of their efficient MRT system. We stayed at Cozy Corner Guesthouse, probably the cheapest place to stay in Singapore. One thing I immediately noticed back when we were still planning the trip was that even on a limited budget, Singapore is still an expensive place to visit. Costs for transportation, accommodation, food, and admission fees are all considerably higher compared to its neighbors. It was money well spent, though. Singapore is a beautiful place to visit … not for a long-stay coz it’ll probably burn my budget pretty deep. This is the list of holidays by country. Most holidays are mentioned although some are not public holidays. An asterisk (*) denotes a movable holiday.